Tindaloo in CyberSpace: Greetings Earthling! hello! super cute, luv the image and scene! I am so glad you played along with us at simon says stamp wednesday challenge! That is one amazing sky full of stars! Thanks so much for linking up and playing with us at Time Out Challenges. I love this card! Fantastic use of my little moonwalker stamp! 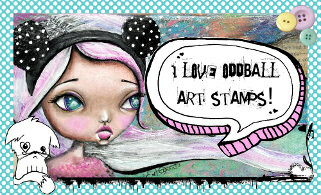 Thank you so much for playing along with the Oddball Stamps "Best Friends" Challenge! Such a fun card! Love the images!